Nothing gets your blood going like the taste of fresh ginger in your juice. 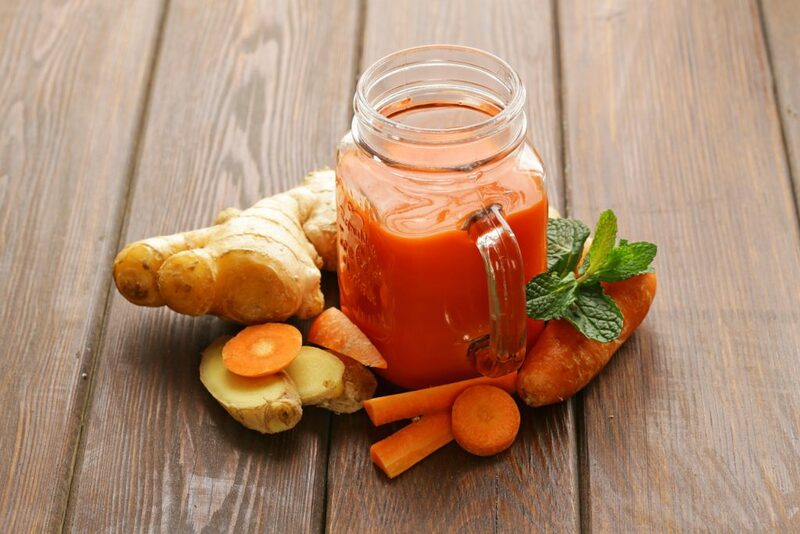 This bright orange juice blend is easy to make and is loaded with vitamins A and C.
Slice up the ginger and roughly chop the apples, and then just run it all through your juicer. You should get one good glass of juice from this recipe. You can’t talk about spicy vegetable juices without a tomato blend in the mix. This recipe is particularly potent with the addition of a little jalapeno. Seed the peppers, and chop everything enough to fit through your juicer. Process and enjoy. If you do find the jalapeno a little too much for you, use a smaller piece or even omit it. Even without the jalapeno, it’s a lovely smooth and savory juice blend. Turmeric is all the rage right now as an anti-inflammatory spice ingredient. Now you can have some in your juice. Juice everything but the cinnamon, which you stir into your juice once it’s done. If you’re ready to take the spicy level up a notch, why not a little curry in with your green juices? An unusual mix this time, but definitely worth a test drive. You can sub cayenne in for the curry if you want a different taste. Juice everything, but add the curry powder to your glass before you drink. If you’re not used to spicy juice blends, you might want to adjust the recipes down a little until you try the final products. Just don’t be afraid to add a little zing to your next juicing experiment. As always, we recommend (of course) using the Healthy Juicer!